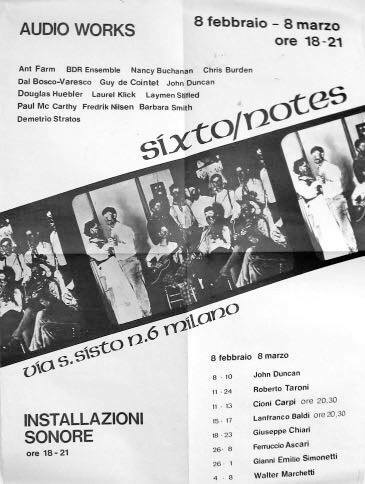 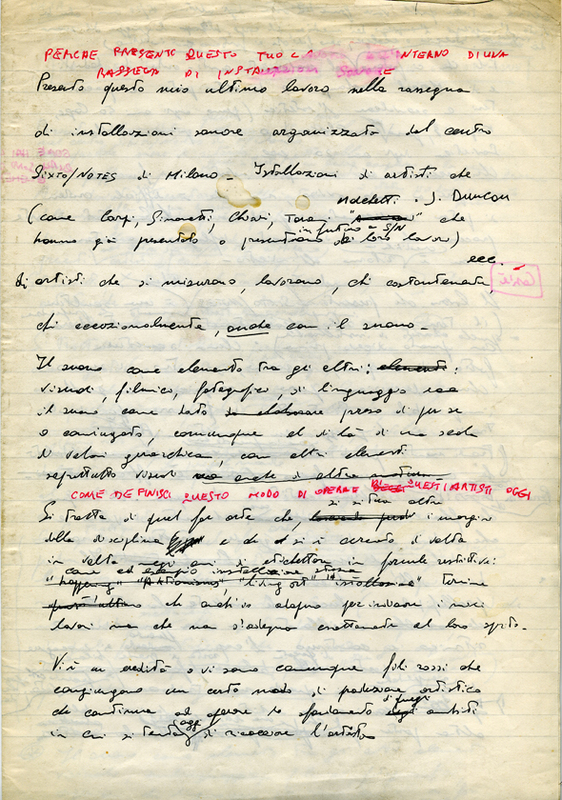 —Ferruccio Ascari, Luisa Cividin, Daniela Cristadoro, and Roberto Taroini—was to follow two lines at once: the creation of an archive of film documents, and the production of an exhibition program of installations and performances able to express the artistic climate in Italy, Europe and United States at that time. 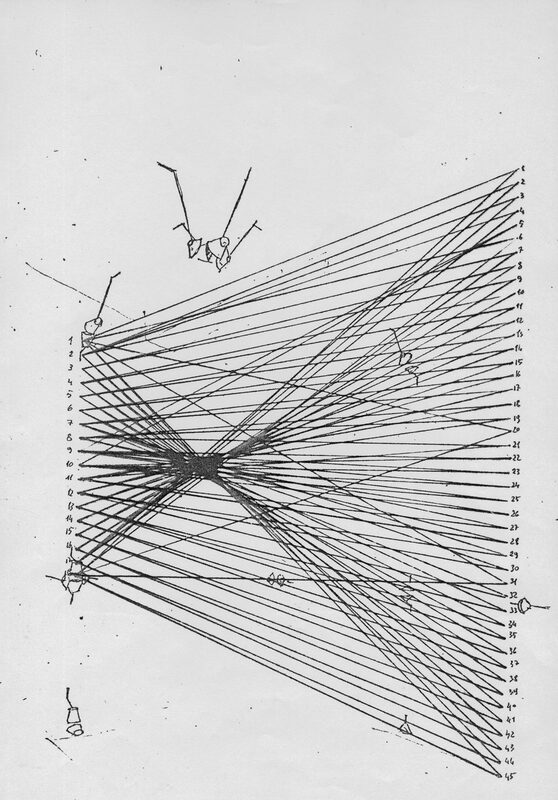 The main focus of the center was on experiences characterized by an intercontamination of languages aimed at re-defining the field of art, its boundaries and trends. 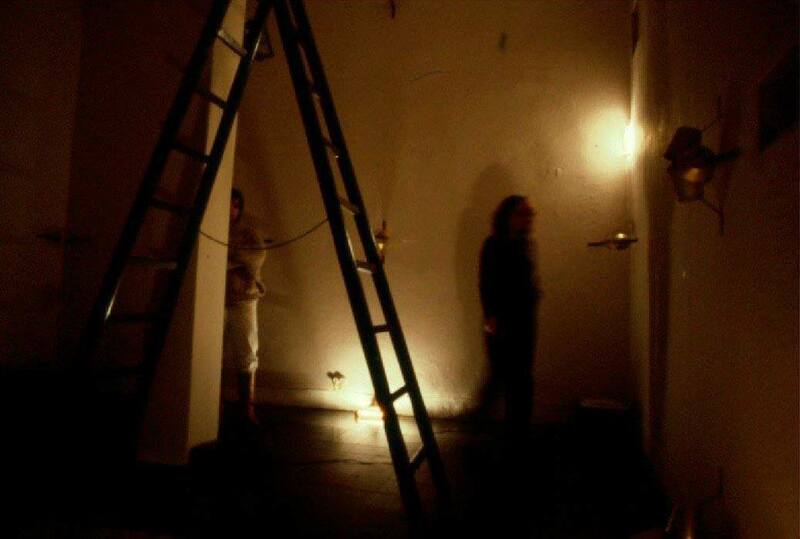 This is the context in which “Untitled,” a sound installation and performance by Ferruccio Ascari, would be read: this work was conceived and created within a program of sound installations organized by the center, which included site-specific works by Lanfranco Baldi, Cioni Carpi, Giuseppe Chiari, John Duncan, Walter Marchetti, Gianni Emilio Simonetti, and Roberto Taroni, along with contributions by representatives of the most radical researches of those years: Ant Farm, BDR Ensemble, Nancy Buchanan, Chris Burden, Dal Bosco-Varesco, Guy de Contet, Douglas Huebler, Layurel Klick, Laymen Stifled, Paul Mc Carthy, Fredrick Nilsen, Barbara Smith, and Demetrio Stratos. 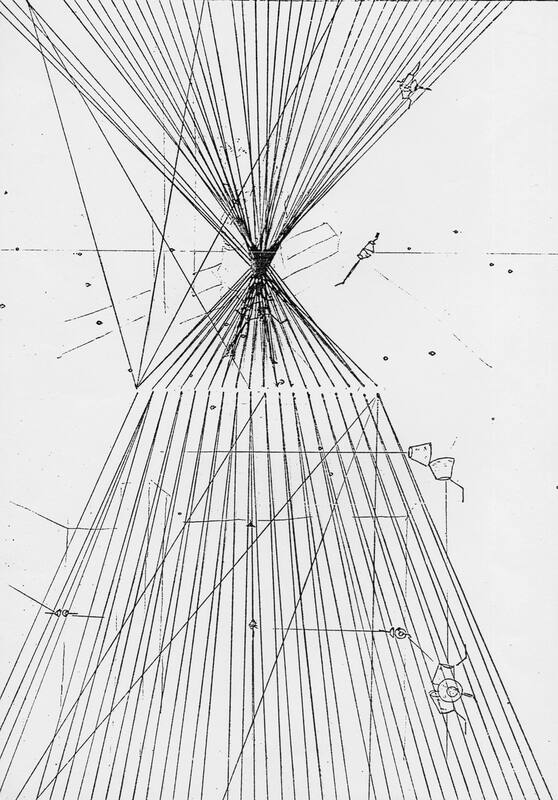 “Untitled” was an emblematic example of a research common at that time in which visual and sound elements were considered as indissolubly bound together, in an analysis which started from a deep reflection upon the categories of time and space in art. 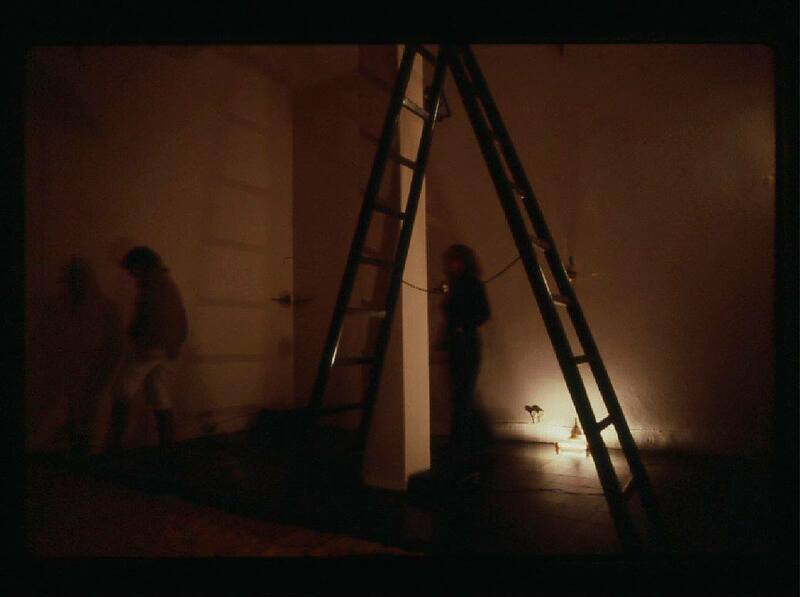 The paradoxical purpose of “Untitled” was to measure the architectural space by the use of sound, or even better, to find a sound equivalent of the architectural space; to walk through it in order to catch its specific volumetric, dimensional, visual, and acoustic qualities; to find the law by which it was governed and to establish a relation with the subject walking through it; and finally, to find a way of making the space respond to sound impulses until its own Sound was discovered, “the uniqueness and unrepeatability of its resounding in relation to what occurs within it”—as Ferruccio Ascari wrote in a presentation text of this work. 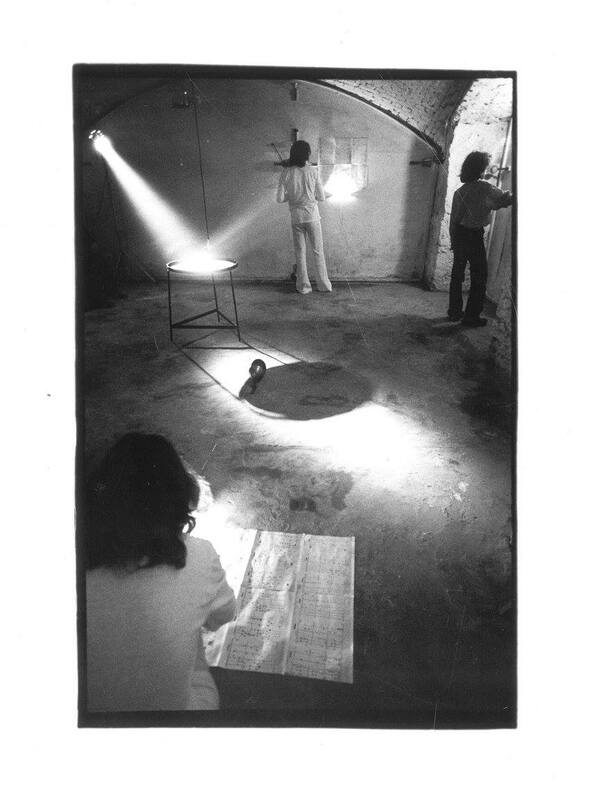 “Untitled” was subsequently reproposed in different sites, the eighteenth-century chapel of the University College of Pavia (1979) and the theatre Aut/Off in Milan (1980): on these occasions, the work was presented under the new titles of “Vibractions I” and “Vibractions II” and produced very different results not only at a sound level. 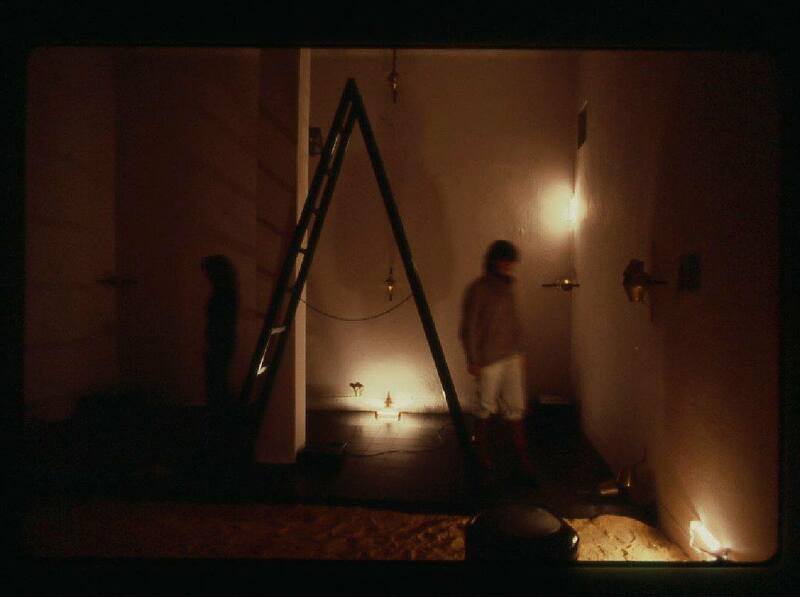 The spatial qualities of each place (dimensions, volumes, architectural typology) were reproduced by a network of harmonic strings running through the floor, the walls, and the ceiling of the room: the strings were anchored at their ends to metal frustums of cones which served as resonance boxes. 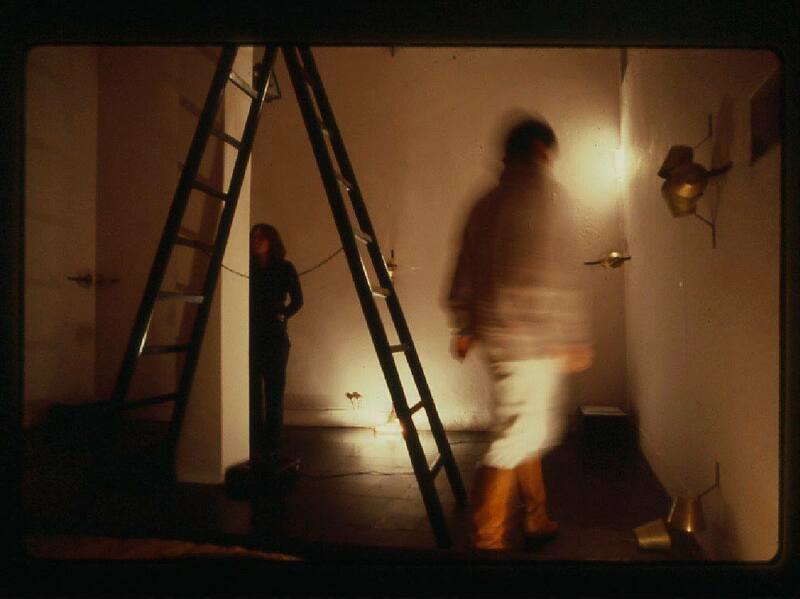 The sound equipment–designed and realized following mathematical proportions deduced by the environment’s volumetric ratios—became the instrument used to investigate the acoustic specificity of each space, to seize its innermost identity, or, in Ascari’s words, to “find out its own sound” and therefore to disclose its essence. 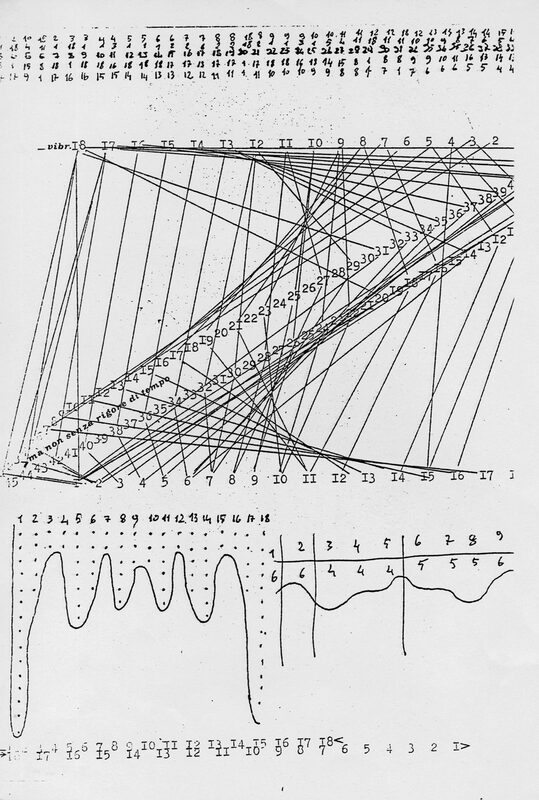 The “epiphany” was committed to the moment of the performance, during which the environment/instrument was “played” by a variable number of instrumentalists/agents: by the use of plectrums, violin bows, and hammers, all of them made the harmonic strings vibrate according to a score that was also mathematically deduced by the volumetric ratios of the space. 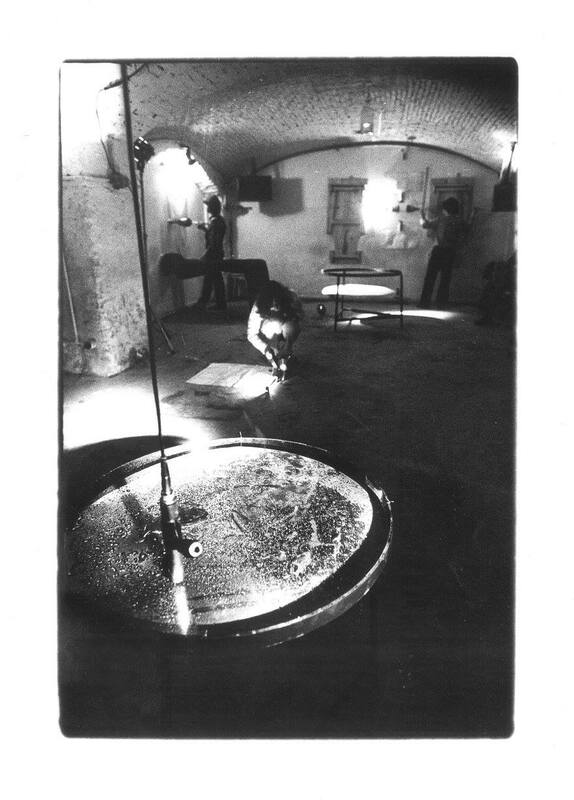 Drops of water fell regularly from a cruet hanging from the ceiling onto a large iron disc anchored to a tripod: their sound, amplified through a microphone, punctuated the duration of the event. 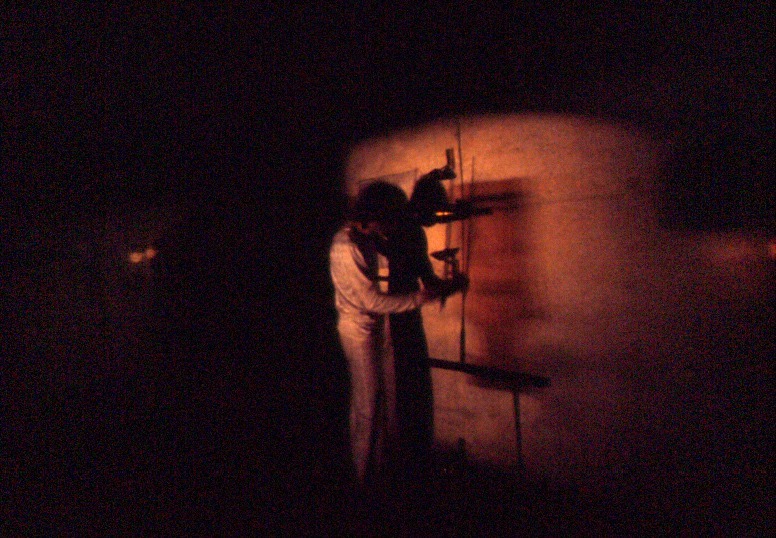 A looped video reproducing the environment while walked through by the agents/instrumentalists was projected onto the environment itself: the projector placed on a rotating base followed optically the path of the instrumentalists. 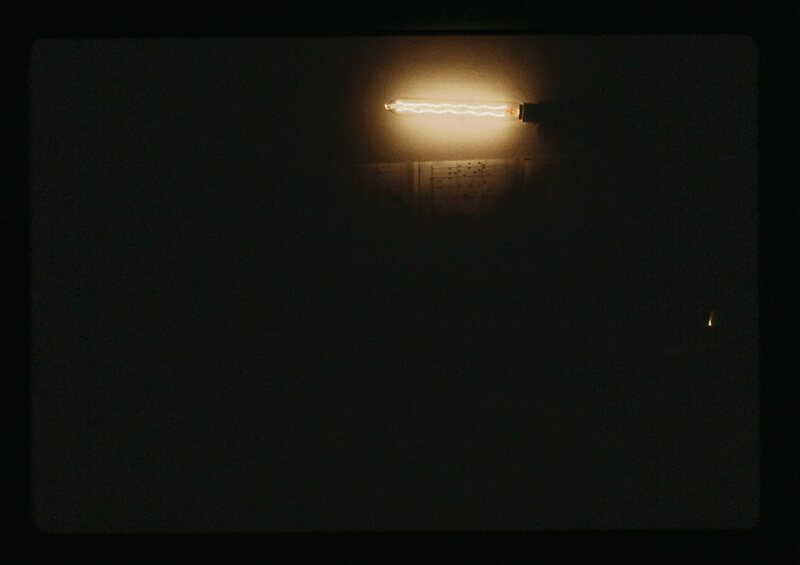 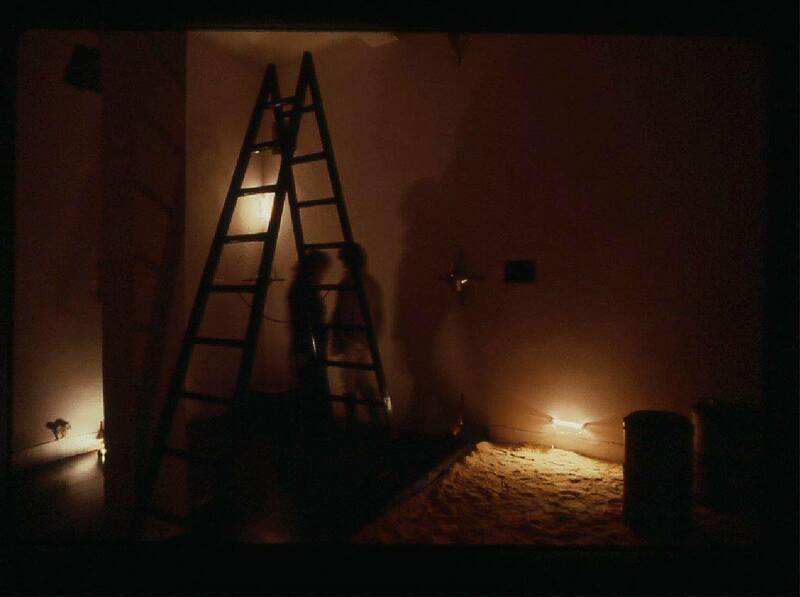 “Untitled” was composed of three interconnected levels—installation, performance and film. 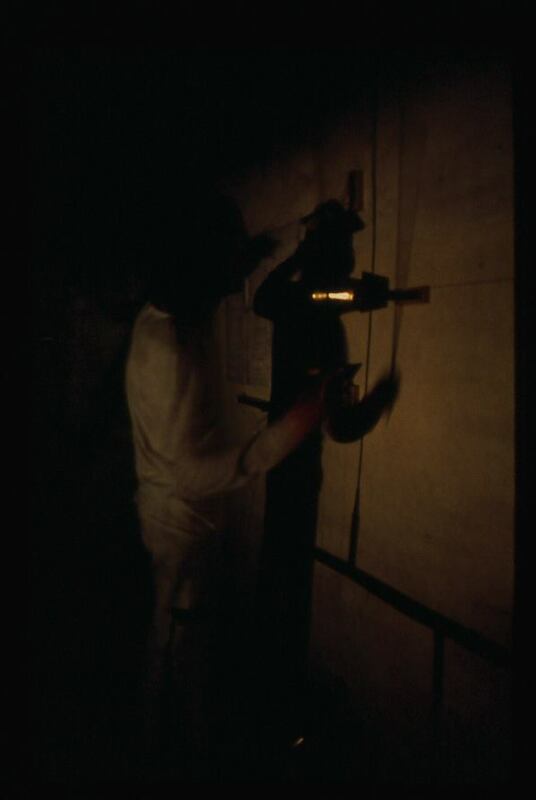 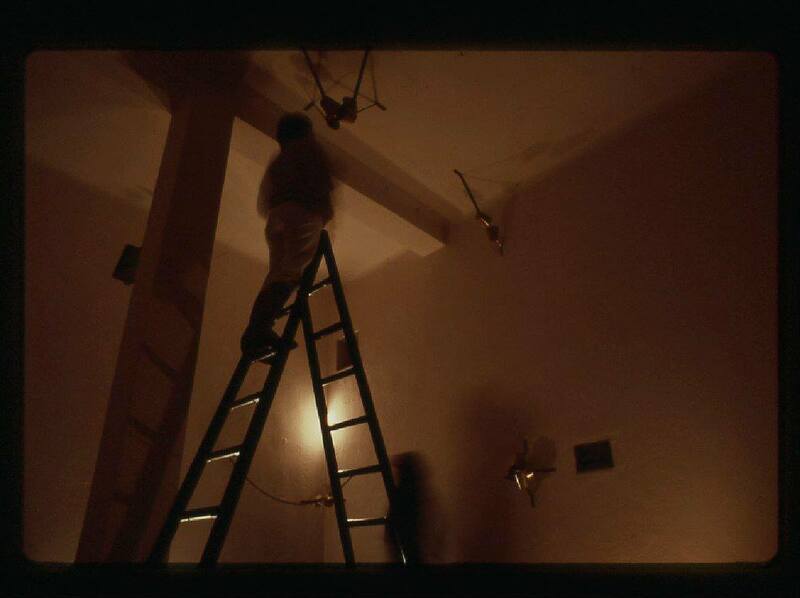 In the installation, the harmonic strings running throughout the walls were conceptually determined as “visible” sounds even before they were put in vibration. 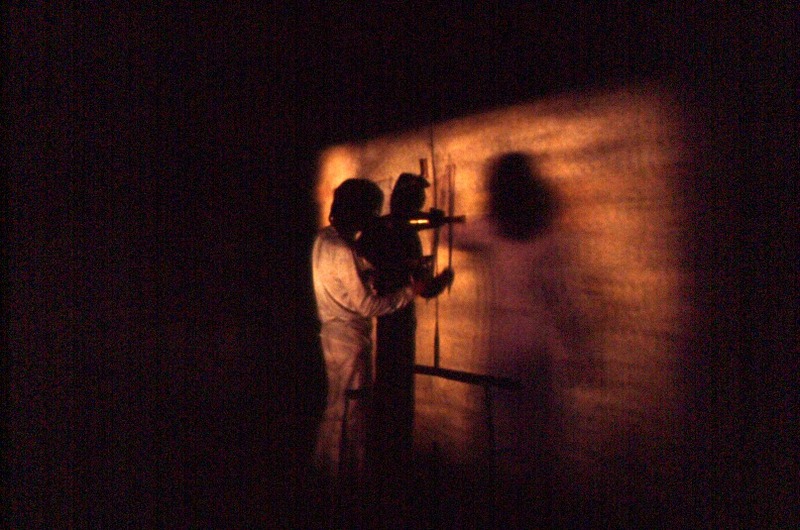 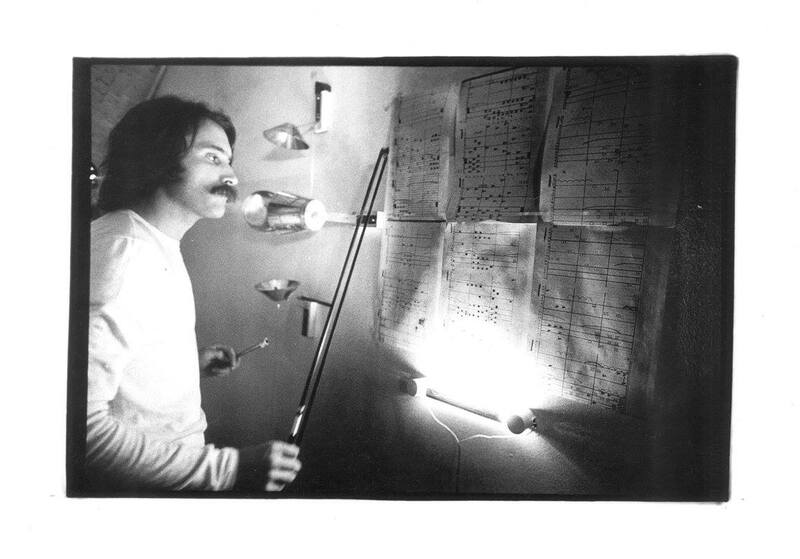 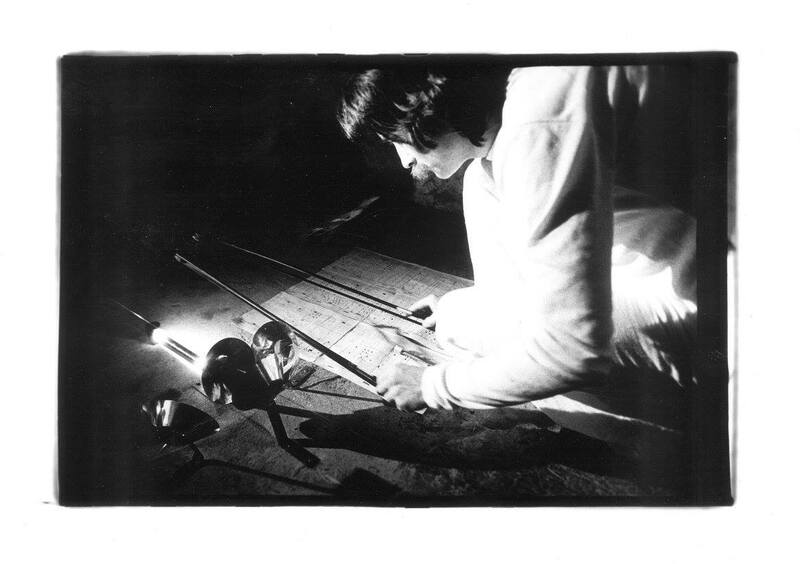 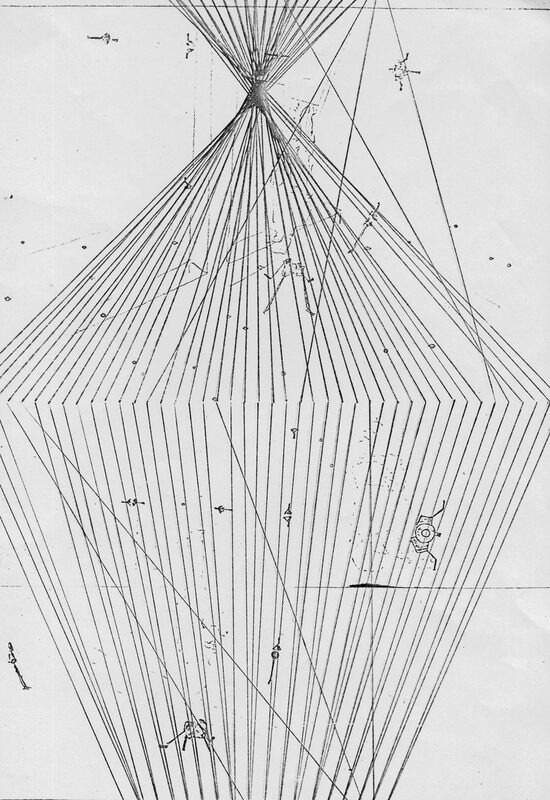 In the performance, the action exercised on the strings was an act of “dis/in/canto,” an Italian word which etymologically means exactly “something producing vibrations”: by resounding and lowering, the vibrations originated kind of an immaterial motion in the space and turned into “acoustic images,” while the environment became an instrument entirely run through by harmonic strings. 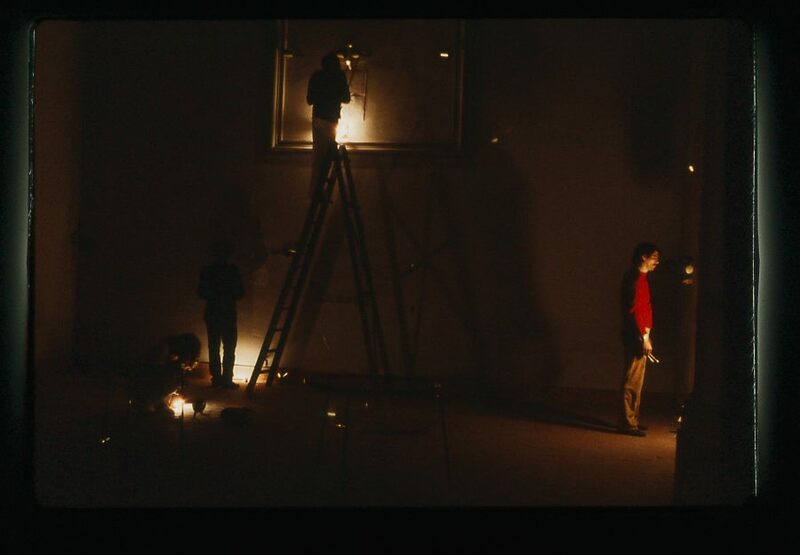 The video reproducing the environment and projected onto the environment itself gave shape to a sort of visual whirl, where projection and action became indefinitely knotted and untied, in a continuous relationship of illusion/disillusion. 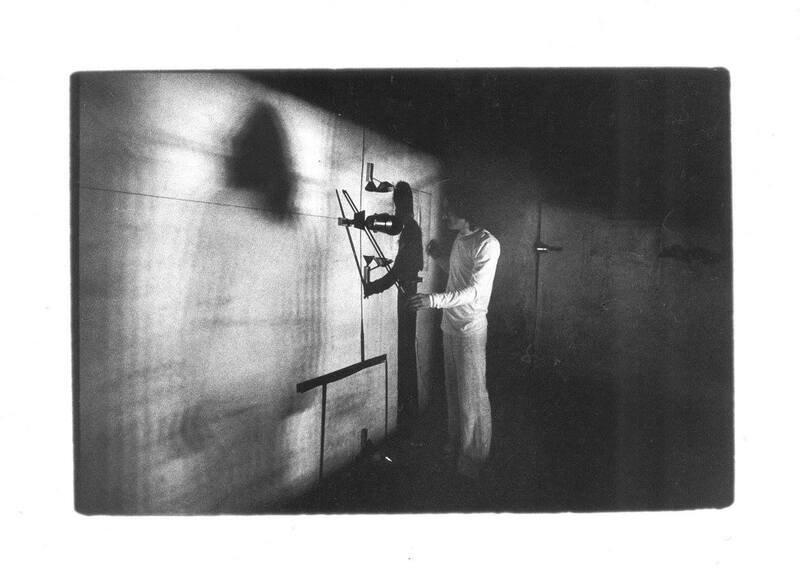 Of this work, so conceptually and visually tied to the radical investigations of that time, only part of the equipment is left, along with a few meagre notes, a certain number of pictures, and a sound recording. 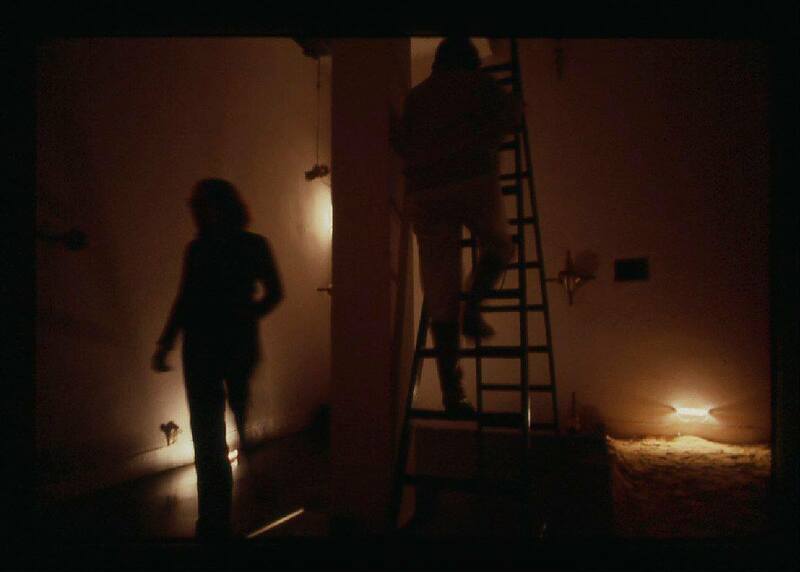 More than thirty years later, in 2012, Ferruccio Ascari will refer to this 1978 work in a recent series of environmental installations among which Vibractions 2012 and Casa Anatta [Non Io].